Readers Question: Evaluate the importance of knowing YED in a firm’s decision-making process. Knowing the YED of a product may help a firm respond to changing economic situations and help the firm to plan ahead. Demand will increase during periods of recessions and economic downturns. Therefore, in a recession, Tesco may be advised to advertise its value products. This may attract customers trying to survive on a tight budget. If the economy was booming, then firms like Tesco, should try to promote luxury items (e.g. Organic bread). These good will sell better as incomes are rising. If a firm is producing an inferior good and economic growth in the long term is positive, then they should consider diversifying into producing normal goods. For example, a firm producing black and White TVs should switch to colour and then HD TVs. Note what is a luxury good today may become an inferior good tomorrow as changing technology changes consumer expectations about goods. If a firm knows that YED of a good is over 1. 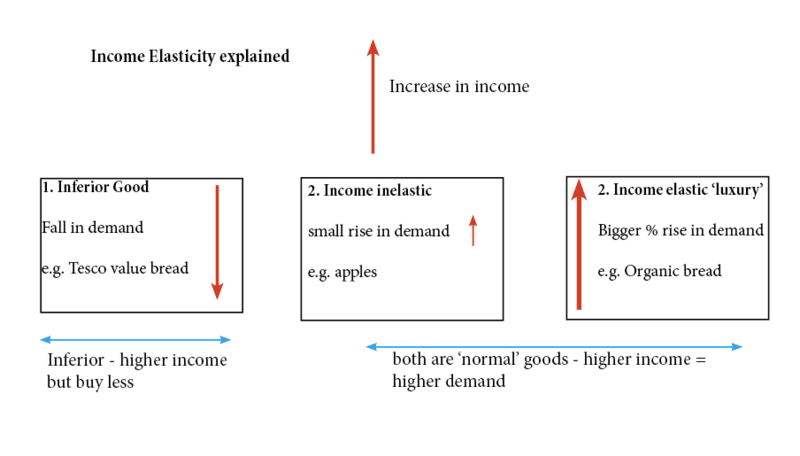 Then it means it is income elastic (luxury good). This means that demand will be sensitive to changes in income. High economic growth may lead to a boom in sales, but, the firm should be aware that this boom in sales could come crashing to an end if the economy went into recession. Therefore, firms should be nervous about overstretching themselves. There may also be a case to diversify.